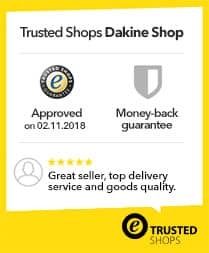 Through this website, we can only process warranty claims for Dakine products purchased at www.dakine-shop.com If you have purchased your product from another Dakine distributor, please contact the store where you purchased the Dakine product. They will help you with your warranty. My product was already defective at delivery. What can I do? We're sorry that your item has reached you defectively! Please contact us immediately via this warranty form, since we need to check and report your case within 7 days after the delivery date on the tracking ID. If you report the defect at a later date, we will have to apply the same proceedings as for items that have been damaged during use. My product was damaged during the warranty period. Is the defect covered by Dakine? Our warranty covers material and manufacturing defects. The warranty does not cover wear and tear damage such us faded colors, material wearing over time and tears caused by a crashes, accidents or inadequate care. To avoid unnecessary postage charges, please contact us via this warranty form before sending us the parcel with your defective product. Our service team will get in touch with you as quickly as possible, to coordinate the further proceeding of your warranty with you. Please note: If your warranty claim was rejected by Dakine, you may have to cover the postage expenses yourself (possibly retrospectively). How long will the processing of my warranty complaint take? We kindly ask you to consider, that the processing of your warranty complaint can take up to 14 days after we receive your product, since we are bound to follow certain patterns for the inspection. Our team of experts will evaluate, whether your warranty claim is approved and whether your product can be repaired or needs to be replaced or refunded. For liability for defects, the statutory consumer rights will apply. Please also consult our terms and conditions.